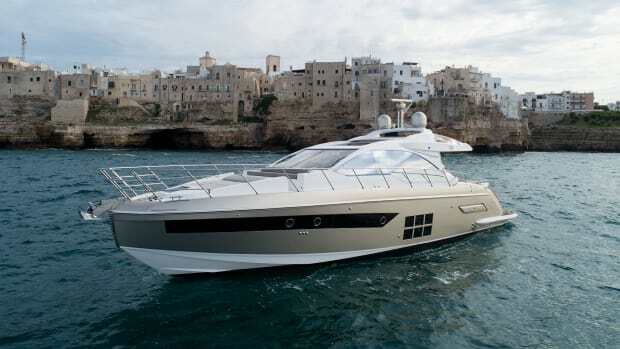 A top speed of 37-plus knots is only part of the performance equation for the Riva Rivale 56. 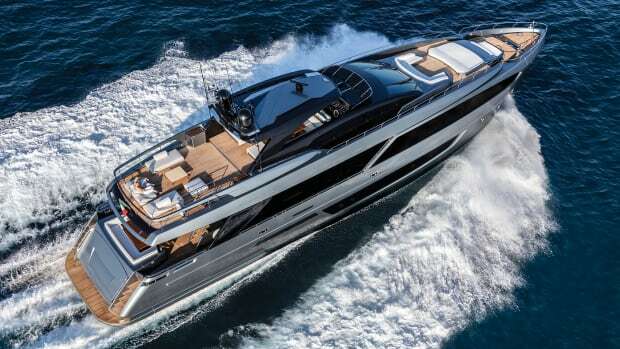 A top speed of 37-plus knots is only part of the performance equation for the Riva Rivale 56. Handling helps set this boat apart. 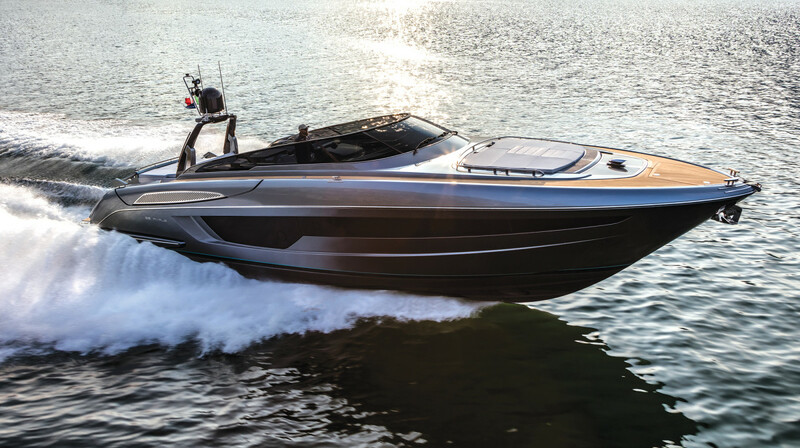 Riva continues its quest to turn heads on the water with the 56 Rivale. In the fall of 2017 Riva followed the unveiling of its beautiful Rivamare, the talk of the 2016 Cannes boat show, with the equally beautiful Rivale. As another alluring example of the shipyard’s classic, open-boat styling, this latest model from the legendary boatbuilder is no overgrown runabout, but a substantial craft that launches into the highly charged sector of sub-60-foot sport yachts. Although in length, beam, and horsepower, none of its obvious rivals can be set up as an exact match, there are plenty of valid comparisons to be made. In response to that, of course, the many Riva aficionados who fondly remember the brand’s illustrious heritage as a style icon of the dolce vita era will murmur with a condescending smile that Riva doesn’t have any obvious rivals. 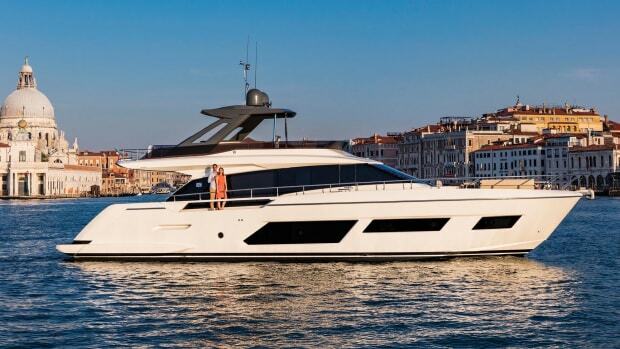 It is a marque apart, each boat a validation of its owner’s taste and discernment. To a remarkable extent, more than 20 years after the last mahogany Riva was launched (mahogany-faced plywood, in fact), this is still actually true. 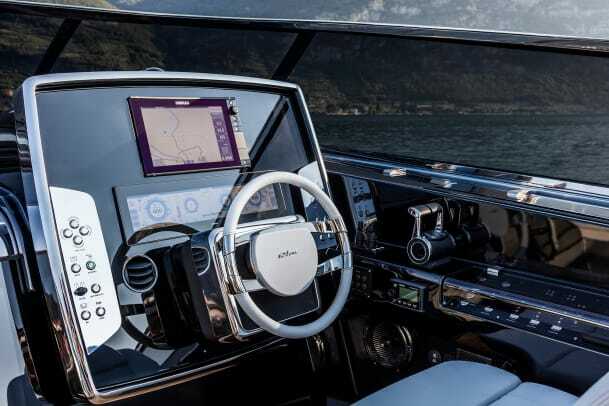 A modern Riva might be made of fiberglass, with standard naval architecture, fitted with the same internal components you find on other boats, and powered by engines that bear the badges of German and Swedish companies, but the boats nevertheless still have an aura about them. 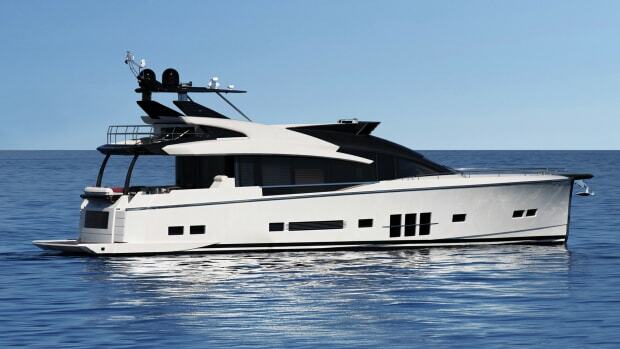 The salon makes full use of the 56’s nearly 16-foot beam and the styling is classic Riva. 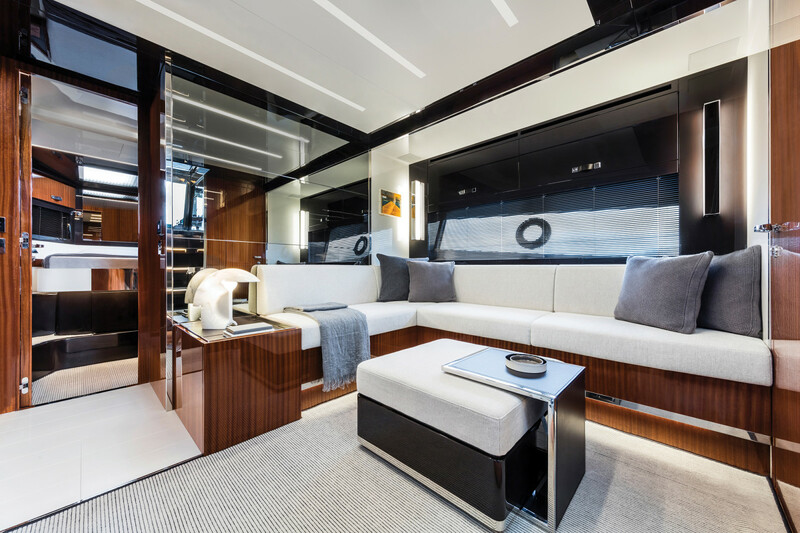 It is there in the detailing, in the bespoke stainless steel deck fittings and in the hand-stitched leather trim. It is there especially in the many coats of varnish that bring the woodgrain up to a mirror sheen, and in the hull’s lustrous paint job. Above all it is there in the look. 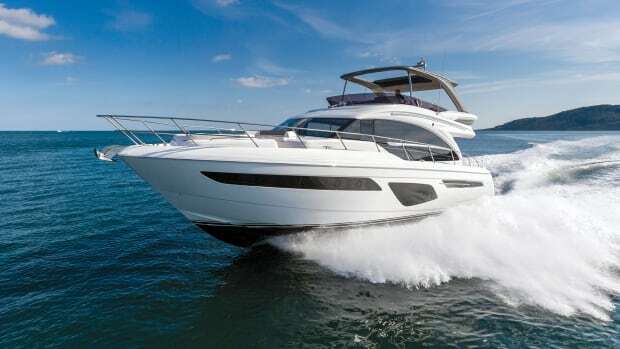 All boats these days are designed from the inside out, because as customers we demand full-size beds, sensible headroom, big fridges, air-conditioning, and all the other luxuries. Rivas are no different in this respect; however tasteful and discerning you might be, onboard comfort is not negotiable. 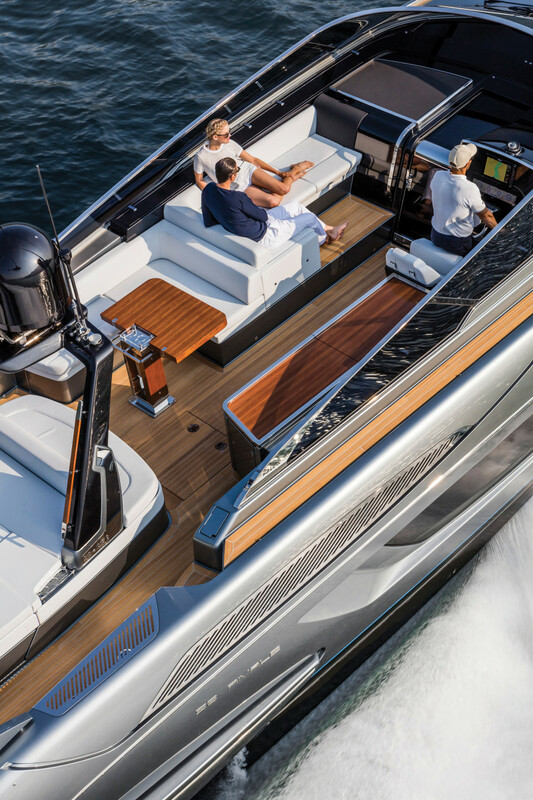 But while it does design from the inside out, more than other production boatyards, Riva thinks from the outside in. 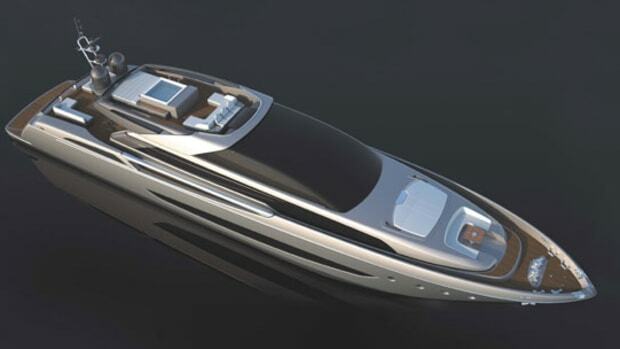 Few modern production boatbuilders place a higher premium on the look. 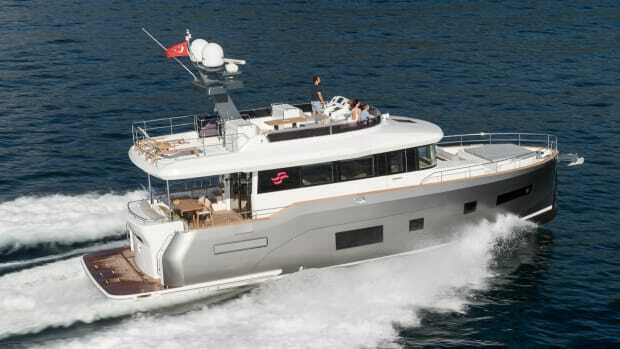 A three-cabin boat, or two-plus-crew in standard form, the Rivale’s curved windscreen and open styling, uncompromised by any hardtop, harkens back to the marque’s influential early designs—although there is a very good bimini that unfolds electrically to shade the helm and forward seating, and another over the foredeck, if you tick that box on the options list. The open look is deceptive, of course. This is a substantial vessel nearly 16 feet in the beam, and the midships master cabin makes full use of it with a double berth mounted athwartships and a spacious head and shower on the port side, both served by spectacular hull windows set into those sculpted topsides. The VIP suite feels less generous, but it still has the 6-foot 6-inch headroom and you shouldn’t get any complaints about the size of the bed. There is also en suite access to a roomy head with separate shower—this being a well-equipped yacht with a separate dayhead, handily placed amidships on the starboard side, convenient for the lower salon and its small galley area. The port guest cabin we found on our test boat, which was the third off the production line, is an option: The Rivale’s standard layout sees this space occupied by a crew cabin, accessed down through the cockpit seating. In either incarnation, it’s a very small space. It may have 6 feet 6 inches of headroom and two 6-foot 3-inch bunk berths, but they’re only 23 inches wide and the floor area is so minimal that turning around requires a bit of planning. In this respect the Rivale is no worse than many rival boats of this style and size. The cabin is surprisingly well off for stowage, however, with four good drawers and a reasonable hanging locker, and many owners will probably find that they’re using it not as a cabin, but as a large and useful upholstered cupboard. It is obviously right that this vestigial sleeping wardrobe for your least complaining guests is only suggested as an option, but instead of offering a crew cabin in its place, it might make more sense to many owners if the shipyard fitted out this space as a bespoke stowage compartment. It is always a privilege to take a Riva through such a crowded and critical arena as the Cannes boat show, and be reminded of the powerful effect a beautiful boat can have on those who appreciate such things. People look up. Heads turn. It’s a bit like being a hypnotist. Out at sea this alluring machine proved to have performance and poise to match its looks. With the larger of the two available engine options, twin 1,200-horsepower MAN V-8s, it was hardly going to feel short of power, although the engines themselves, squeezed into a modest compartment beneath the tender well and driving traditional shafts through V-drive transmissions, might be a little short of legroom. 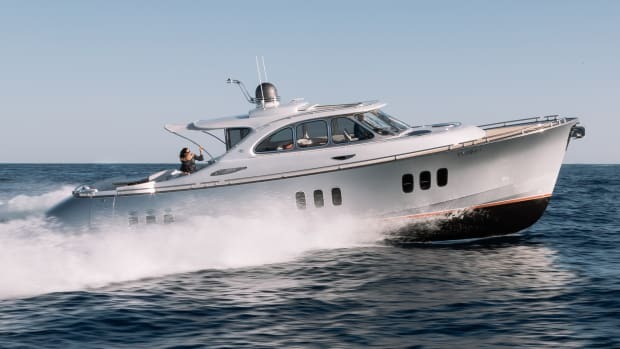 Willing in acceleration and responsive to the helm, the Rivale was a pleasure to drive, achieving a top speed of over 37 knots without apparent effort. A moderate transom deadrise of 17.8 degrees is carried well forward and provides a generous lifting surface, the downside of that being a pretty hard ride while powering into a chop. Ours was a balmy day with a light breeze and no seas to speak of, but it was easy to create firm impacts across our own wake. The tall windscreen offers excellent protection from the breeze, but with its distortions in the curved corners and dark tint, it’s not great to look through, and for this 6-foot helmsman at least, neither is it easy to see over. But these seem like trivial points to make about a boat this stunning. Actually being aboard and then driving the Rivale will only heighten your enjoyment. Coming back into the crowded Vieux Port at Cannes after a thoroughly exhilarating sea trial, greeted by the accustomed covert glances and frankly admiring stares, I half-expected a ripple of appreciative applause. 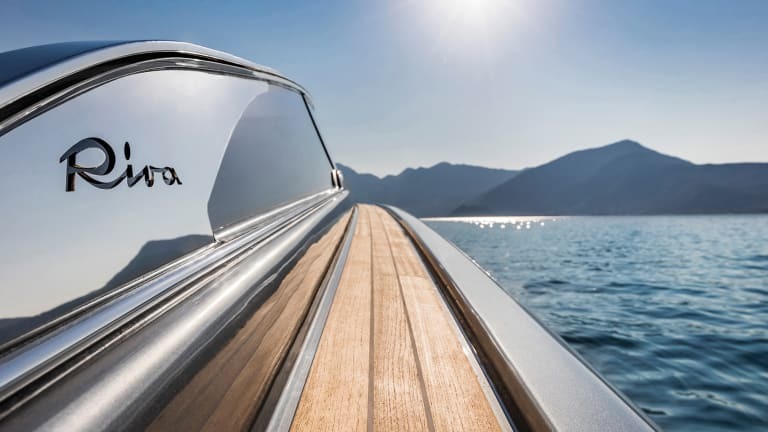 Riva has still got it, whatever it is—that indefinable, undeniable aura of being special. In this, at least, the Rivale has no rival. TEST CONDITIONS: Air temperature: 68°F; humidity: 35%; seas: 2&apos;; wind: 4-8 knots. LOAD: 264 gal. fuel, 99 gal. water, 10 persons. Speeds are two-way averages measured w/GPS. GPH taken via MAN display. Range is based on 90% of advertised fuel capacity. 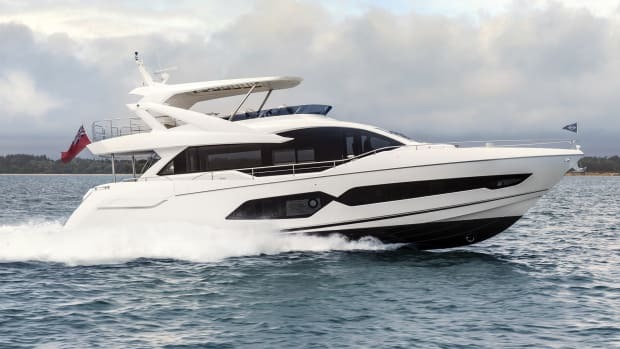 NOTEWORTHY OPTIONS: Three-cabin layout; 1,200-hp engines; 17.5-kW generator; gyro stabilizer; “super tropical” air-conditioning; metallic hull paint; teak decks; underwater lights; bow bimini; 34-gph watermaker; electric curtains; electric stern thruster.